AE Smith delivers Heating, Ventilation and Air Conditioning (HVAC) and refrigeration services to the MCG. Working very closely with the site the team service the venue’s many cool rooms, freezer rooms, domestic fridges, the main holding freezer, under bench fridges, and ice machines. For over 18 years, the MCC has been a VIP customer of AE Smith, and have shared a long history. AE Smith’s specialised commercial refrigeration technicians and mechanical services team are permanently based on the grounds, providing full time support. The AE Smith team readily collaborate with other suppliers in order to achieve the best outcome for the client, and have the ability to influence the best outcome by recommending trusted suppliers with experience and expertise. With a proven record of delivering large and complex projects, AE Smith solves services integration issues onsite. AE Smith designs and manufactures custom-designed solutions, creating innovative refrigeration solutions, including an ‘Energy Efficient Refrigeration Control’ system to regulate energy efficiency. Over the years, there have been many improvements made to the MCG, such as the installation of an open protocol Building Management System (BMS) to allow the MCC team to have greater control and management of all refrigeration systems. The AE Smith MCG team complete regular condition reports on all MCG equipment, with a full inventory. Keeping a range of consignment stock onsite, if anything breaks down, the team can fix it immediately, without any issue or delay. Having consignment stock onsite limits travel and inconvenience, and minimises the downtime of sourcing parts. AE Smith maintains strong supplier relationships. In response to customers’ needs, AE Smith maximises exceptional quality and value outcomes from established national organisations and smaller suppliers, to promote and support local businesses and the community. Through technology, installing controllers and probes, AE Smith understands the site, how you use the equipment and when it’s used. AE Smith learns the MCG’s Asset Lifecycle Management procedure, helping with the process of acquiring new equipment. Every year AE Smith undertakes an asset audit, inspects the equipment provided, and reviews its lifecycle. With commercial refrigeration with the kitchen and chefs involved, AE Smith creates different solutions, and help to educate users of our equipment. 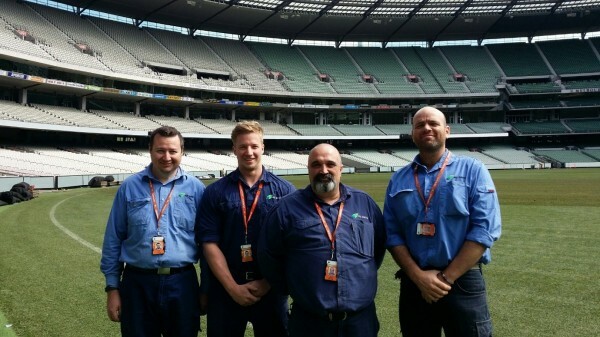 In 2015, AE Smith serviced the AFL Grand Final at the MCG, addressing general HVAC and refrigeration issues on the day. Three AE Smith Technicians, Tristan Reichelt, Sauro Benedetti and Lucas Boucher, were present onsite for an extended shift. The team successfully addressed general Refrigeration and HVAC issues and as a value-add, assisted our client in managing the raising and lowering of the netting and support poles behind the goals.